“While earning the Environmental Science merit badge, Scouts will get a taste of what it is like to be an environmental scientist, making observations and carrying out experiments to investigate the natural world." “A nation is a patchwork of communities that differ from each other and may be governed differently. But regardless of how local communities differ, they all have one point in common: In the United States, local government means self-government. Good citizens help to make decisions about their community through their elected local officials." 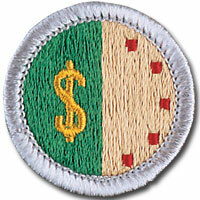 "Scouts who earn the Citizenship in the World merit badge will discover that they are already citizens of the world. How good a world citizen each person is depends on his willingness to understand and appreciate the values, traditions, and concerns of people in other countries." “First aid — caring for injured or ill persons until they can receive professional medical care — is an important skill for every Scout. With some knowledge of first aid, a Scout can provide immediate care and help to someone who is hurt or who becomes ill. First aid can help prevent infection and serious loss of blood. It could even save a limb or a life. Mike A., Gloria G., Kate A., Olivia H., Mohammad H.
“Personal management is about mapping a plan for your life that will involve setting short-range and long-range goals and investigating different ways to reach those goals. Education, training, and experience all help make your goals become a reality. To achieve your goals, you will choose the best path and make a commitment to it, while remaining flexible enough to deal with changes and new opportunities." "The family is the basic unit of society and is important to both individuals and communities. The world is rapidly changing, making today's society much more complex than ever before. As Scouts earn this merit badge, they will realize why it is important to know more about family life and how to strengthen their families." Search within the blog. Press Enter when ready.